ISCED-F 0388 Inter-disc. Progr. involv. Social Sciences, Journalism a. Inform. The Master’s programme provides students with a sovereign approach to sociological, social and political method and theory, skills that are key to the proper assessment of socio-scientific studies in applied fields of sociology, political science and empirical social research. Socio-scientific perspectives sharpen the view for social phenomena on the macro, meso and micro level. 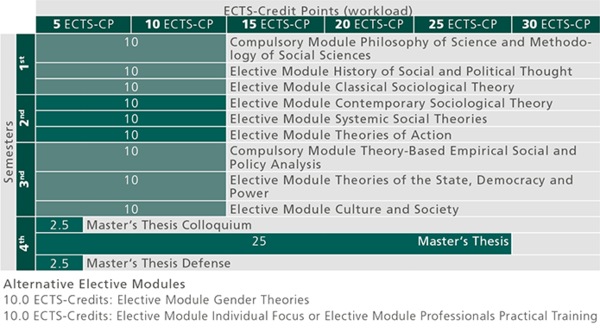 Thus, power structures, social differentiation and inequality, state, culture, religion, ethnicity, globalisation processes, socio-cultural conflicts, aesthetics, gender as well as action mechanisms, interaction orders, familial structures, socialisation and identity are central topics dealt with in the Master’s programme. Extra-functionally, the students acquire mental flexibility, analytical skills, communicative understanding of the new and generalisable knowledge as key qualifications. In addition, they acquire social skills, mediation and presentation techniques, teamwork skills and improve their verbal and written communication. The Master’s programme also contributes to the strengthening of independent performance and promotes critical reflection and tolerance towards other positions. Graduates possess sound knowledge of the fundamental theoretical paradigms and discourses of the social sciences and understand their relevance for empirical social research and social practice. This enables them to address problems independently, to assess scientific knowledge and its motivation, to apply it in new research contexts and further its development creatively. Graduates are prepared for activities in scientific facilities and institutions (especially for the continuation of their studies in a doctoral programme) and for positions requiring leadership, planning, analysis and consultation in the private sector, in public administration and in international non-governmental and governmental organizations. last but no least, for activities in the broad field of social research, social counselling or the rapidly growing media sector.